Of course the date of something that never happened SHOULD be in dispute. Because it is so obvious that the Exodus could not have happened in 1447 BCE, a few apologists have realized that truth and tried to argue for another date. One nitwit, Gerald E. Aardsma, Ph.D. tries to show how the Exodus occurred in 2447 BCE. “Dr. Aardsma’s chronology places the Exodus 2447+/-12 BCE Support for Aardsma’s position is found at his website: Biblical Chronologist. We think that in his desperate attempt to prove another, more likely time for the Exodus, Aardsma has ignored another important biblical non event; The Flood”! Jacob arrived in Egypt 430 (400?) years before the Exodus. That would put their arrival in Egypt in 2877 BCE. Various documents put the date of the flood around 2348 BCE. See Creation.com or Answers In Genesis. So, according to this nitwit, Jacob arrived in Egypt BEFORE the flood, the flood occurred and then came the Exodus. There, now he has just proven that the commonly accepted date for the Exodus is wrong! No problem there! What year was the data compiled? I see 2015 on that timeline. 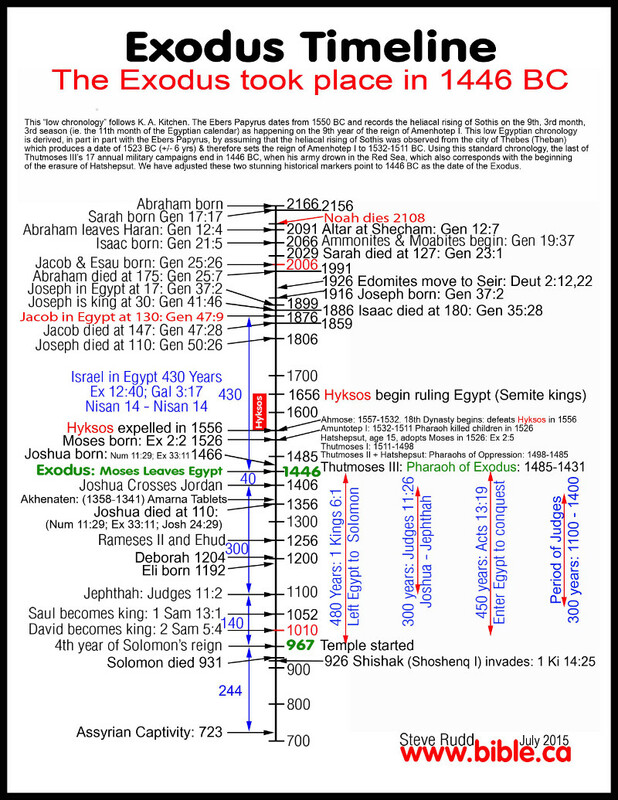 When was the data first noted that 1446 BC is the year of the exodus? Also, Moses has a similar story to Sargon of Akkad who predated the Moses story. Sargon, so the story goes, was placed in a reed basket as a baby, put in the Euphrates River only to be plucked out downstream by a palace worker. He was raised as a royal and grew up to become the leader of a great nation. I believe there is an even older story that goes back to India in which a baby is placed in the Ganges River in a reed basket and somehow becomes a god. I’m not super sure of the paticulars of that story. A quick note regarding Dr. Aardsma’s theory: he says *all* biblical events before the united kingdom need to be dated 1000 years earlier. He has not made the trivial error which you claim he has. He literally wrote a book explaining his dating of the flood to 3500 BCE, which is hundreds of years before Jacob’s arrival in Egypt in his model. I do not mean to claim his model of history is at all related to reality. As a non-religious person, I feel no need to try to reconcile any biblical chronology with history since I have no commitment to believing biblical chronologies in the first place. However, his model is at least internally consistent, and you appear to be criticizing (and mocking!) it without understanding it. Oh…. good point! I do enjoy mocking nonsense. And I do acknowledge that finding the “correct” date for an event that never happened is ridiculous. Anyway, I’m sure Aardsma is wrong about everything he says so my being wrong about HOW he is wrong makes me right – or something like that.